David A. Armstrong will be inaugurated March 20 at 1 p.m. as the 10th president of St. Thomas University in Miami Gardens. MIAMI GARDENS | Global, ethical leadership will serve as the overarching theme for St. Thomas University’s upcoming inauguration of President David A. Armstrong. Armstrong will be formally installed as the institution’s 10th president in a ceremony on Wednesday, March 20. Events throughout the week of March 18, which include two symposiums and a student ball, will celebrate this milestone. The inaugural convocation and investiture ceremony will begin at 1 p.m. on campus at the Fernandez Family Center. 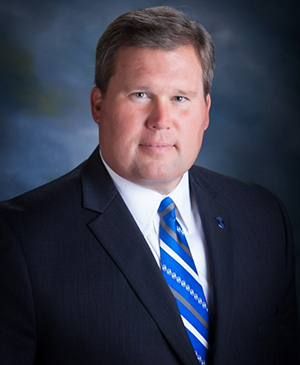 The program will include salutations from various dignitaries, and a presidential address during which Armstrong will outline his vision for a new era of leadership and excellence. A community-wide reception will immediately follow. Among those in attendance will be Archbishop Thomas Wenski, who will celebrate Mass at 10 a.m., along with Auxiliary Bishop Peter Baldacchino, in the campus' Chapel of St. Anthony. Also expected at the inauguration ceremony: Frederica Wilson, Congresswoman, Florida District 24, U.S. House of Representatives; Barbara J. Jordan, Miami-Dade County Commissioner, District 1; and Oliver G. Gilbert III, Mayor of the City of Miami Gardens. St. Thomas University is located at 16401 N.W. 37 Ave., Miami Gardens, 33054. St. Thomas is the only Catholic archdiocesan-sponsored University in Florida. It offers more than 45 undergraduate, graduate, and post-graduate degrees at its 144-acre campus in Miami Gardens, and through distance learning, including one of the oldest (and highly ranked) undergraduate programs in Sports Administration in the country.